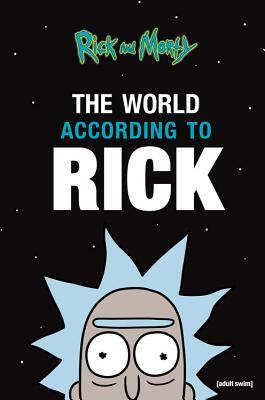 A must-have gift book: the wit, wisdom, and frequent diatribes of mad scientist Rick Sanchez of Adult Swim's Rick and Morty, the Emmy-winning, #1 animated series on TV. Finally, from the self-appointed "Most Intelligent Being in the Multiverse" Rick Sanchez of Rick and Morty: a mind-bending collection of his innate and acquired wisdom. Each season, Rick and his grandson Morty embark on thrilling earthly and intergalactic adventures, all for the benefit of science (and Rick's inflated ego). But what makes the depraved genius tick? Now Rick is eager to impart his unique (and sometimes disturbing) take on life, love, and everything in-between for the benefit of aspiring mad scientists everywhere. Fully illustrated with color images from the show, The World According to Rick is a collection of Rick's most famous (and not so famous) sayings, monologues, and quotes, complete with a personal introduction by the mad man himself. A truly unique and special book, this collectible is sure to become a cult favorite like the show that inspired it.